Swimming ear bands are the perfect way to keep swimming ear plugs in - and water out! These soft and comfortable headbands come in a variety of fun colors and sizes to fit toddlers, children and adults. Just wear an earband over a pair of moldable silicone ear plugs, and you never have to worry about your ear plugs falling out at the pool or beach. 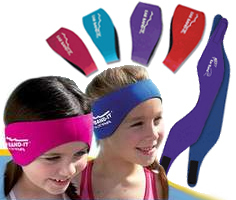 Designed by an ear, nose and throat doctor, the original swimming headband (the popular Ear Band-It®) was created so that kids with ear tubes would have a complete, simple, and affordable system -- a pair of moldable ear plugs and a swimming ear band to hold them in place -- to keep their ears safe and dry during swimming and bathing. Now, other great swimming bands are also available, and these ear plug accessories have become an absolute must-have swim safety item for both children and adults with ear tubes. Please note that all swimming bands are designed for surface swimming and for general, fun splashing around - not for diving. Even a very snugly-fitted swimming ear band worn over a well-sealed pair of plugs isn't sure to keep your child's moldable ear plugs in place if your child is doing cannonballs off the high dive.